Natural Armor: Wild Elves gain a +1 to their Armor Class. Replaces stalker. Scent: Wild Elves gain the scent ability. Replaces pulse of the wild. Bite: Wild Elves gain a bite attack, 1d2 + Strength modifier to damage. Replaces terrain stride. Silent Hunter: Wild Elves are renowned for their subtlety and skill. Elves with this racial trait reduce the penalty for using Stealth while moving by 5 and can make Stealth checks while running at a –20 penalty (this number includes the penalty reduction from this racial trait). Replaces woodcraft. Hide in Plain Sight: While in his favored terrain, a wild elf gains +2 to his Stealth check and can use the Stealth skill even while being observed. Replaces stalker. Wild Talent: The Wild Elf chooses one, 0 level arcane, divine spell or psionic ability; at 10th level a second ability may be chosen. This ability can be used as a standard action, 2/day +1 per day/half Wisdom modifier. The following feats are available to a wild elf character who meets the prerequisites. Wild elves are rarely seen by others, because they live in the heart of thick forests and have incredible skill at keeping hidden. Their skin tends to be dark brown, and their hair ranges from black to light brown, lightening to silvery white with age. 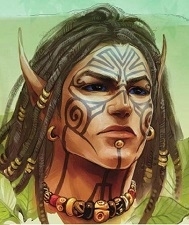 Wild elves are a very reclusive race and prefer to be with their own kind in the deep forests. They often cover their skin in tattoos or ritual scaring. Their housing, clothing, weapons and equipment look primitive but are well-made.